Larry Ernest Riffey, 73, of 118 Windsor Road, Fairfield Glade TN, died peacefully at his home on Saturday May 21st 2011. Born January 13th 1938 in Cumberland MD, he was the only child of Ernest Austin Riffey and Loretta Alberta (Delaney) Riffey. He married Barbara Jean Davis on April 11th 1959 at Laurel Grove Baptist Church in Sutherlin VA. Following graduation from Harrisonburg High School in 1956 and a year of photography study at Richmond Professional Institute (now Virginia Commonwealth University), he joined the Air Force; serving as a B-52 missile technician with the 27th Fighter-Interceptor Squadron at both Andrews AFB and Loring AFB. After his military service, he held several jobs including program director of WSVA TV in Harrisonburg VA. His love of photography eventually brought him to Eastman Kodak, where he worked in professional photofinishing technical, sales and management capacities for 24 years until his retirement in 1991. Upon retirement from Kodak, he worked with Dwayne's Photo (Parsons, KS) for five years. He learned to played trumpet by ear as a youth. As an adult, he played with several bands including the Jaycees Band and the Harrisonburg Veterans Band. 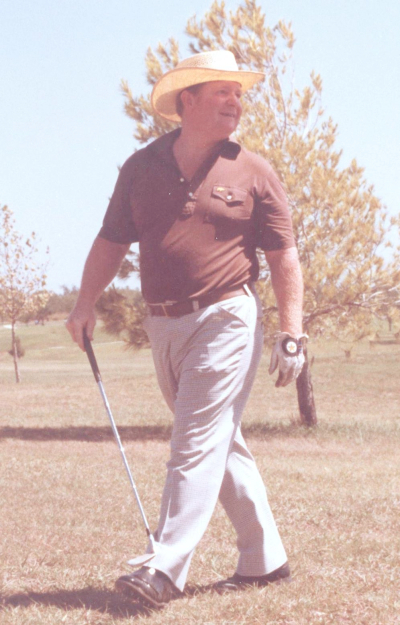 In addition to photography, he loved to play golf and invested many years in genealogy research on both his and Barbara's family history. Larry is survived by his wife Barbara, son Mark (wife - Jacki), daughter Sheryl (husband - David), 3 grandsons (Alex, Jon and Daniel) and two great-granddaughters. Memorial services will be held on May 28th 2011 at Fairfield Glade United Methodist Church at 10:30am, with interment in the church's Memorial Garden immediately after. Golf attire is requested, as Larry wouldn't want folks in suits and ties on a warm day better suited for golf. In lieu of flowers, the family suggests that memorial gifts to the Hospice of Cumberland County, 30 East Adams Street, Crossville, TN 38555 (cumberlandhospice.com). The family will receive friends after the interment at a reception at Fairfield Glade UMC and at other times at Larry and Barbara's home. Golf attire is requested, as Larry wouldn't want folks in suits and ties on a warm day better suited for golf.